Stating that its ATM operations are making losses, nation's largest bank SBI has said it is all for charging customers for transactions. It also said a commercially viable model is needed for ATM network expansion. 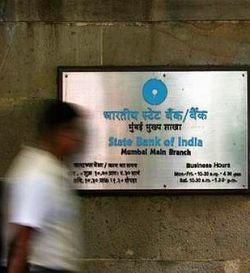 "Whatever services we give, ultimately it has to be a win-win situation.... We just want a commercially viable model, I cannot afford to lose month after month," State Bank of India (SBI) Chairperson Arundhati Bhattacharya told PTI in an interview. SBI is having the largest network of ATMs. Bhattacharya also said barring in a few states, the ATM operations are making losses. She did not name the states where the ATM segment is making money. She said SBI cannot subsidise ATMs forever. "The loss from ATMs is very concerning. I would like to roll out many more ATMs. I am ready to do that, but I need to explain also how I am going to sustain this," she said. When asked about the industry demand that customers be charged for ATM services, especially after the push in costs of ATMs after the Bangalore incident wherein a woman was attacked inside the ATM kiosk, she said SBI supports the idea of charging even its own customers. "If you are looking at extending the ATM network and making it available to more and more people, there has to be a commercially viable model," she said. expansion. The Finance Ministry had mandated that each state-run bank would have an adjoining ATM in place by the end of the current fiscal. At present, banks allow customers five free transactions per month at other banks' ATMs and unlimited at own bank's. However, the home bank has to pay the other bank Rs 15 per transaction, even though the transaction may be for free to customers. Bhattacharya said: "I have a huge number of accounts who have very small balances. Now, if these people go and access some other ATM and not mine, for every such transaction I have to pay that bank Rs 17 (including taxes). I am not earning anything from that account, how can I bear these charges forever?" She also conceded that SBI loses out because of the long queues at her banks' ATMs due to which customers walk across to adjoining ones, forcing SBI to pay the other bank. Indian Banks Association has made a representation to the RBI seeking a reduction in the number of free ATM transactions, including at home ATMs, to 5 per month, saying the recent increase in security expenses alone will cost them Rs 400 crore a month. RBI deputy governor KC Chakrabarty, who himself was a banker before joining RBI, had castigated banks for the demand and termed it as ridiculous. Chakrabarty had last week told private television channel: "It is very ridiculous and illogical that banks are charging customers for withdrawing money, and that too from their own ATMs. It never happens anywhere," he said and advised banks to increase efficiency and also opined that better competition can help.